From time to time my students bring one of their new pedal purchases into a lesson. 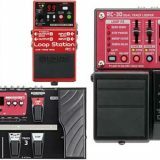 On occasion students have found ridiculously cheap ‘clone’ pedals and expected them to be perfect copies of the originals. Most of the time the cheap clones were nowhere near the quality of the pedals they’re meant to be copying. When one of my students brough in the Joyo JF-02 Ultimate Overdrive Pedal and told me it’s a $40 clone of the $140 Fulltone OCD, I expected the worst. Find out in this review how wrong I was. As you can see, the features are pretty basic – just like the Fulltone OCD. But of course, that’s the point – a simple pedal aiming to achieve a great sound. I should point out straight away it’s a big surprise to see True Bypass on such a cheap pedal – that’s one thing to watch out for when considering any cheap pedals because if they don’t have True Bypass, they could seriously degrade your tone. As the pedal only has three knobs and one High/Low switch – it’s very simple to use. The Gain and Tone knobs are the key to your tone and you will only need to use the Level knob to keep your level consistent. In other words, you will spend most of your time adjusting the Gain and Tone knobs. It’s very simple to use and couldn’t get any easier. 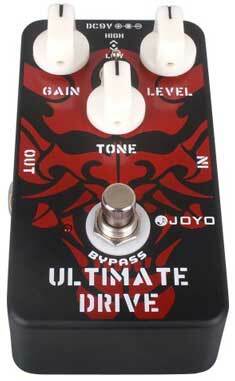 This is where the Joyo Ultimate Overdrive really shines. When I first tried out the JF-02, I was expecting similar disappointing results to other cheap Chinese clones I’ve tried out. When a pedal is this cheap it makes you think about the quality of the electronic components and whether any shortcuts were taken (ie: dodgy soldering). Fortunately, this is one of the very few cheap clone pedals that actually achieves its goal. This pedal sounds amazing! Although I don’t own a Fulltone OCD to do a direct comparison, after watching the below video, it’s very clear that the Joyo comes ridiculously close to the OCD’s tone. You need to really listen closely to hear the minor differences between the two pedals and a blind test would stump most experienced guitarists. The point here is that quite often a clone doesn’t come anywhere near the quality of the original pedal. In this case, the Ultimate Overdrive does come close enough that the minor differences you can hear are negligible. Would you pay an extra $100 for the minor difference in tone you hear from the video above? For most people – the difference just isn’t worth an extra $100. Now let’s look at the actual tones this pedal produces. The Joyo JF-02 is basically a midpoint between a distortion pedal and an overdrive pedal. It aims to capture the feel and sound of an overdriven vintage tube amp and just like the OCD it aims to produce rich overtones. The Joyo easily achieves this goal and at the same time, it does have the flexibility available with a distortion pedal. So this type of overdriven tone works best with rock and punk where you’re aiming for a rich tone like the tone you would hear when playing any classic rock riffs. Those overtones? Fantastic. Even at a low volume you can hear the richness in the tone and know that as soon as you crank up the volume you’re going to get a nice full sound. There’s plenty of gain available and I never felt that I had to max it out to get any type of tone I was after. Of course, some styles require more gain than this pedal aims for, but it’s perfect for classic rock, punk or even some blues. My student bought this pedal to use for AC/DC songs and it’s perfect for that style. You know you really enjoy the tones a pedal produces when you play the same riff over and over just to hear how the pedal responds to your playing. 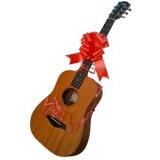 In this case, I love how the overtones produced sound when playing full chords. It creates such a lush wall of guitar. Of course, single notes sound great too and with the right gain and tone setting you can easily hear those overtones reacting to your sound. I recommend starting with a low gain setting then gradually increase it so you can find the pedal’s sweet spot that sounds right to your ears. Once you find that sweet spot, adjust the tone knob and listen to how it changes your tone. It doesn’t take long to find the perfect setting (for you) with this pedal. The High/Low switch was a bit disappointing for me but I can see how it could be useful for some players. You can think of the High/Low as a boost to drive, but to my ears it sounds like the Low setting adds a bit of mid scooping and the High setting adds drive across a flat EQ. So when experimenting with your tone using this pedal, I would think of the High/Low switch as a way to alter your tone rather than add or remove some drive. Joyo is a Chinese company and for a $40 pedal it’s fair enough to question to quality and reliability of this pedal. Whenever I normally come across $40 pedals it’s cheap plastic ones my students have purchased from an Aldi catalogue. The Ultimate Overdrive actually surprised me as it looks like a $100+ pedal. It’s built with a metal chassis and a plastic back plate. The main footswitch boasts True Bypass which is a big surprise from such a cheap pedal. Whether you like the design or not – it’s clear that the quality of the outer construction has been well thought out. I opened up the pedal and while everything looked fine, I do have doubts over Joyo’s quality control. Although the pedal I tested out looked fine, I can imagine other pedals with poor soldering that could cause problems. That’s the only risk with really cheap pedals – you have to wonder how the company can afford to produce these pedals without any compromises along the way. So while I think this pedal is fantastic for home use, if I were to use it at gigs, I would probably re-solder as much as possible just to be safe. My student (who owns the pedal I tested) hasn’t had any problems yet and from what I have seen, I wouldn’t expect any problems. In summary, the JF-02 is surprisingly well made for such a low cost. When other $40 pedals are made of plastic and break after a week, this pedal looks like it will last a long time. I was really skeptical when my student brought this pedal to me and told me that it sounds exactly the same as a Fulltone OCD for $100 less. I was expecting another throwaway cheap knockoff that doesn’t even come close to the original. In this case, Joyo have done an incredible job of producing a pedal that has a fantastic sound for such a low price. Personally, I don’t care whether it’s a blatant knockoff of another pedal or not. The Ultimate Overdrive sounds great at a ridiculously low price. 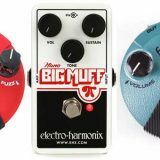 This pedal has allowed my student to achieve a great tone without costing too much and for many players out there this is your chance to get a great sounding overdrive/distortion pedal without spending a big chunk of cash. How much are the Chinese factory workers getting paid to produce a $40 pedal? 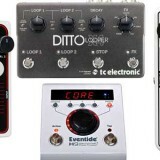 People wanting the Fulltone OCD: if you have tried or heard about the Fulltone OCD and want to get one, but don’t want to spend that much on it, then the Joyo Ultimate Overdrive is an excellent alternative. You will basically have the same pedal for $100 less. While some players might feel that it’s worth spending the extra $100 for the Fulltone, for most players the differences are marginal at best. Wanting a classic rock style tone: the Ultimate Overdrive pedal aims to capture that cranked up vintage valve sound and it does a great job at producing the overtones you would hear in a heavily overdriven valve amp. So if you want to get that AC/DC or Zeppelin sound, this is the pedal for you. You can’t really go wrong at $40. Guitarists not into classic rock: don’t be fooled into thinking that the overdriven valve amp style tone is the only option. Some guitarists talk as if overdrive+valve is the only way to go. It isn’t. If you don’t like the type of tones used in classic rock or punk or any similar style, then this pedal may not be for you. While it is very versatile, it won’t work for every player. So if you watched the video and didn’t feel like you were connecting with the type of tone or styles of riffs played, then look elsewhere. For example, I wouldn’t recommend this pedal for metal guitarists. I tried getting a good metal tone out of it and while it did create a decent tone, it wasn’t anywhere near what is possible with other gear more suited to metal. The point here is that if it doesn’t sound right for you, look for something that’s aimed at what you’re looking for. Don’t try to bend a pedal to fit your style – find a pedal suited to your style. By following these steps you will end up with your ideal settings for both the Low and High options. Your ears will tell you which you prefer the most out of the two settings so simply leave it on the one you prefer the most. Over time your ideal settings may gradually change so if at any point you feel it doesn’t sound quite right, simply follow the steps again. Fulltone OCD – this is the obvious alternative. If you’re happy to pay the extra $100 for the ‘real thing’, then go for it. If you regularly gig and are worried that the Joyo may not be reliable over time, then the OCD would be a good alternative. It is made in the US so the quality of the build should be higher.